Without doubt one of my favourite traditions in Germany is the welcoming of guests with schnapps and, as we were guests with family during our time there, we were welcomed with open arms…and bottles. Schnapps, as we know it in North America, doesn’t hold a candle to the real deal. Here it is syrupy and sweet – more like a liqueur and definitely not my style. But German schnapps is all smooth and flavorful; more like what a flavored vodka is today only more flavorful; packing a punch but convincing you it’s your friend all the same. It is brought out immediately and often, with great fanfare and pride for it is often homemade and has a story behind it. This, really, is the best part; who made it and how…where the recipe came from…how the ingredients were procured. 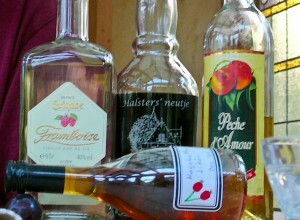 Cousin Frank and his wife, Heike shared a Hagebutten (Rosehip) schnapps that their good friends had made, alongside commercial peach and raspberry options and one that I remember tasting somewhat like Jaggermeister. All were delicious and sampled more than once! Cousin Hanno told a grand tale of travelling to Italy on his motorbike and returning with jugs of 200 proof alcohol on the back of his bike; smuggling the goods across the border to have the best ingredients possible available for his homemade schnapps. I love this story and imagine him on some vintage motorcycle wearing goggles and a leather jacket with his scarf flapping in the breeze as he meanders across country with jugs of alcohol strapped on like paniers…of course it wasn’t like this at all…but a few schnapps in and you’ll believe me! Enjoying schnapps is a large part of my memories of visiting Germany in 1986 with my family. Again lucky enough to be visiting friends, we were welcomed into their Kleingartensparte (allotment garden) complete with the cutest garden house ever, and toasted the evening away with peach schnapps. Hearing the ‘pop’ of the cork and the rousing ‘Prost’ cheer is a warm memory for me. We don’t seem to have the same affinity for this type of drinking here in North America. Bringing out a bottle of this sort of liquor brings to mind doing ‘shots’ as a young drinker and seems much more vulgar than the civilized notion of schnapps. I think I’m going to start a one woman campaign to change this. So, if you find yourself invited to my home in the future, you can expect a warm welcome and an offer of shnapps – hopefully complete with the story of how I made it myself. What a great story! I agree with you, the Schnapps here is very sweet — one of these days I’ll have to try the German version. And enjoying something homemade, with a story behind it… that’s what makes it memorable more than the taste itself. Don’t forget whilst saying Prost to look into the eyes of the person you are saying it to – it is considered rude if you do not. Otherwise, apparently you will have 7 years of bad luck in a certain area… if you do not know what it is, I am sure if you google it you can find out. I forgot about that part and, yes, it’s very important to look everyone in the eye as you cheers them…a tradition we keep even now that we are back home – it’s just civilized!! Thats the way it should be – If that came out in the UK you’d be accused of being an alcoholic, there is nothing wrong with an innocent drink. I only have a bad memory of one night as a teenager and peach schnapps, I must give it another chance. Worst hangover of my life was Oktoberfest and involved Schnaps. I remember I tried to walk up walls. Not pretty. Ooh I’ve had some bad experiences with Schnapps. But in reality, I would love to forge a new experience with it with good friends and good company. If there is one thing (and there is probably more than one) that I’ve learned through all this travelling…it is how to make a guest feel at home: It makes us sound like alcoholics to say it but when you walk in a door and a glass of something that smells dangerous is put into your hand…..it just feels nice! Prost! Good luck on your campaign.